Saturday featured a lecture by Jeff Dunham about ad libbing. Any lecture by Jeff is going to be entertaining and funny. He told about the time he got to a gig and his luggage didn’t. He had to improvise a puppet, so he went to an office supply store and bought construction paper and other stuff, cobbled together a jalapeno figure on a stick, and ad libbed a show with his makeshift creation. Jose Jalapeno went over so well that Jeff had a figuremaker build him a more permanent one. He had the cardboard one with him. He donated it to the museum. 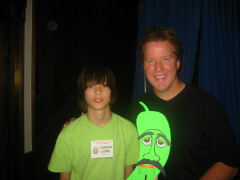 Here's a picture of Jeff with my grandson Landon and the prototype jalapeno. The Saturday Evening Show was a big hit. Bob Rumba was the MC. Impersonating Groucho Marx he did “You Bet Your Life” between the vent acts. One of the volunteers was Japanese and did not speak English, which Bob told us later was not part of the plans. He found a translator who did not speak English well but spoke Japanese and Spanish. Then he found a translator who could translate the Japanese translator’s Spanish to English. It got funnier and funnier. Ken Groves opened the show with George. I hadn’t seen Ken perform since, I believe, 1999. 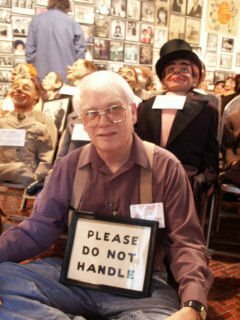 George is a funny character, and Ken is an accomplished ventriloquist, one of my favorites. Landon and I enjoyed Ken’s act, and I bought Ken’s DVD in the Dealers Room after the show. The DVD came with a book of vent tips written by Ken. Ken’s new figure is a Robert McCray bighead figure named Howard, and the DVD includes one of Ken’s cruise ship performances that features Howard. Howard is 93 and carries an oxygen bottle and mask. Dan Horn was the star of the Saturday Evening Show. Dan is the Great Manipulator and a very funny guy, too. One last session at the hospitality suite and then off to bed. Sunday was checkout time and the long drive back to Virginia.